Hó hó. Hó hó. Hó hó. Hó hó. Ldakát yeewháan. Gunalchéesh áwé x̱at yeey.éexʼi yá yee léelkʼu has du aaní káx̱. Yées ḵunatíni áyá x̱át yáax, yá Óoxjaa Héeni, Arapaho Aaní ḵa Eastern Shoshoni Aaní. Tlax̱ wáa sá klig̱éi. Tlax̱ wáa sá likoodzée. Wáa sá ax̱alx̱éisʼ yáaxʼ áwé hás, haa léelkʼw hás, haa shagóon. Yée léelkʼw hás een woosh has x̱ʼal.átgi has du tóog̱aa kg̱watée. Aaa. X̱wasikóo yee aaní áyá, chʼa aan ax̱ tuwáa sigóo shuxʼwáa chʼa yéi gugéinkʼ ax̱ léelkʼw has du yoo x̱ʼatángi x̱walayeix̱í. Gunalchéesh. Hél at wuskóoxʼux̱ x̱at ustí. Chʼa Lingít áyá x̱át. Chʼa Haa Ḵusteeyí yaa at naskwéinix̱ x̱at sitee. Kakḵwa.áaḵw ḵu.aa. Hél chʼas x̱át áyá yáaxʼ. Hél chʼas x̱át áyá yee eedé x̲ʼakk̲wadatáan. Tléikʼ. Ax̱ léelkʼw hás áwé ax̱ eenx̱ has sitee yeedát. Ax̱ káak hás ḵá ax̱ tláakʼw hás áwé yáaxʼ yéi s yatee. Ax̱ léelkʼw áwé Kaséix̱, x̱aan akaawaneek: haa yoo x̱ʼatángi haa wsineix̱. Yéi áwé. Yéi áwé. 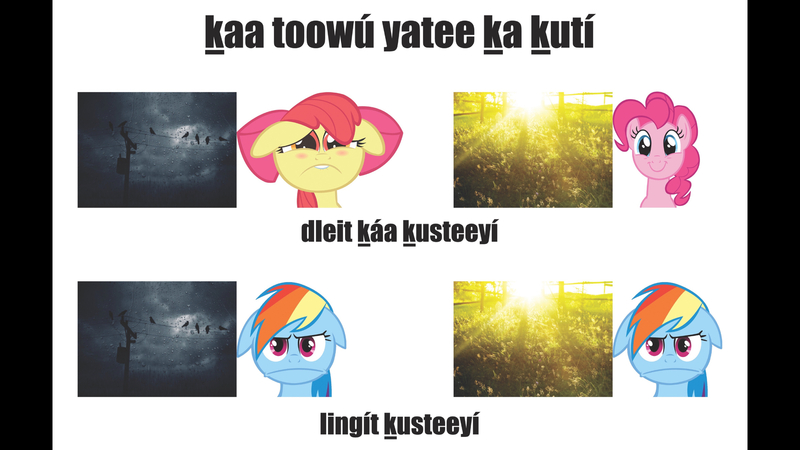 Haa yoo x̱ʼatángi haa tóo yéi yatee. Hél haa jináḵ wulsʼees dakdé. Tléikʼ. Woosh jin tulshát yeisú haa ḵusteeyí tín. Woosh jin tulshát yeisú haa yoo x̱ʼatángi tín. Aatlein haa eeg̱áaa woosoo: haa jeet has aawatee. Haa jeet has aawatee. Ách áwé, a daa yánde gax̱toonáaḵ. Haa yoo x̱ʼatángi káx̱ ḵunaylagaaw! Haa yoo x̱ʼatángi káx̱ ḵúnáx̱ ḵunaylagaaw! Haa dachx̱ánxʼi sáani kagéiyi yís áwé woosh yéi jigax̱toodanéi. Ḵusax̱án een. Latseen tín. Has du káx̱ áwé haa léelkʼw has du hídi áwé wududliyéx̱. Yéi áwé. Yéi áwé, Gunalchéesh yeewháan. Gunalchéesh. 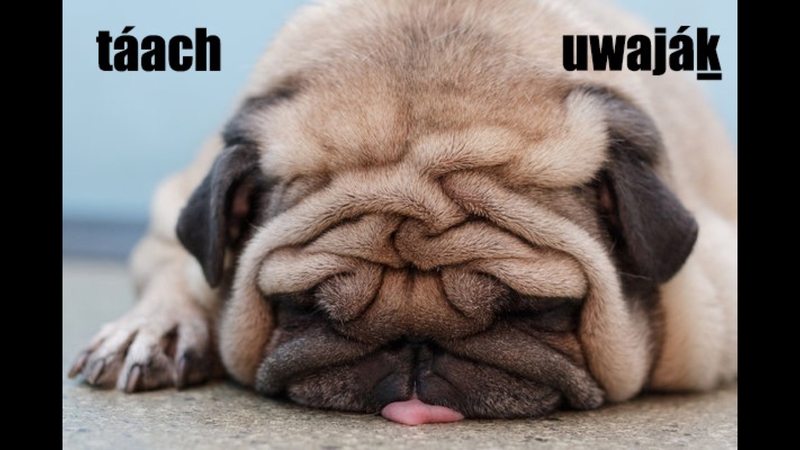 All of you here today. Thank you for inviting me here to the land of your grandparents. I am a new traveler to this place, this Wind River, land of Northern Arapaho and Eastern Shoshoni. It is so beautiful here. It is miraculous. I am wishing that they are here now, our grandparents, our ancestors. If my ancestors were here to speak today to your ancestors, it would be pleasing to them. Yes. I know this is your land, however I wanted to make a little bit of the language of my grandparents. I am not a wisdom bearer. I am just a person. I am a student of life. But I am going to try. It is not just me here today. It will not only be me talking to you. No. My grandparents are with me now. My uncles and my aunties of my clan are here now. 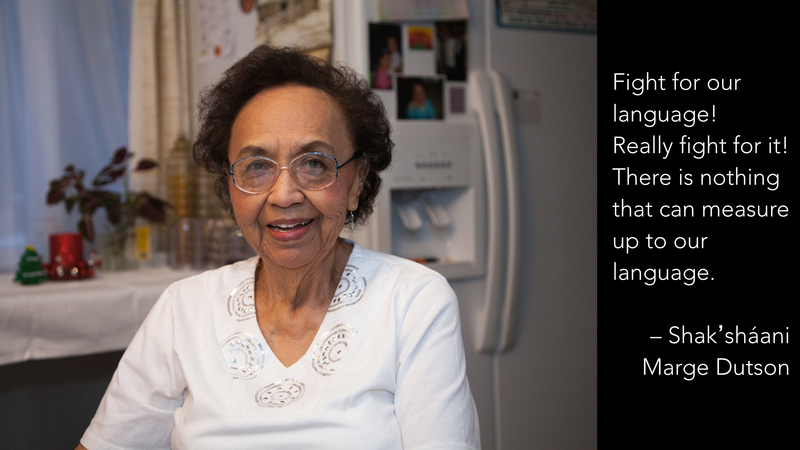 My grandmother Selina Everson told me: our language saved us. That is how it is. That is how it is. Our language is inside of us. It did not blow out of our hands, out to sea. No. We are still holding each otherʼs hands through our culture. We are still holding each otherʼs hands through our language. We are so very fortunate that they gave it to us. They gave it to us. Fight for your language! Really fight for your language! For our little grandchildren we are going to work together. With love. With strength. Our grandparentsʼ house has been built over them. That is how it is. That is how it is. Thank you all. Thank you. I have four things I brought here, that I will leave in this place today, with you. I am just going to try. One of them is the words of my ancestors, which I just spoke and translated. 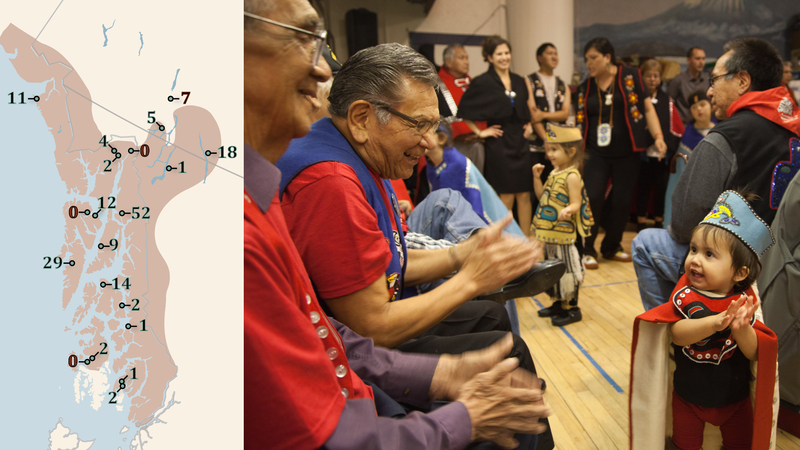 The other three are topics: How I Got Here and What This Conference Means to Me, What it Means to Survive Genocide, and The Revitalization of Our Dreams: Our Children as a Forest of Knowledge. I know it can be taxing to sit and listen to someone, so my plan is to take a mental break every now and then to check in, maybe laugh a little or look at something different on the screens. Maybe that way I will be able to continue. Maybe that way we will connect as human beings. Maybe that way we will remember what took place here today. Maybe we can gain some strength. 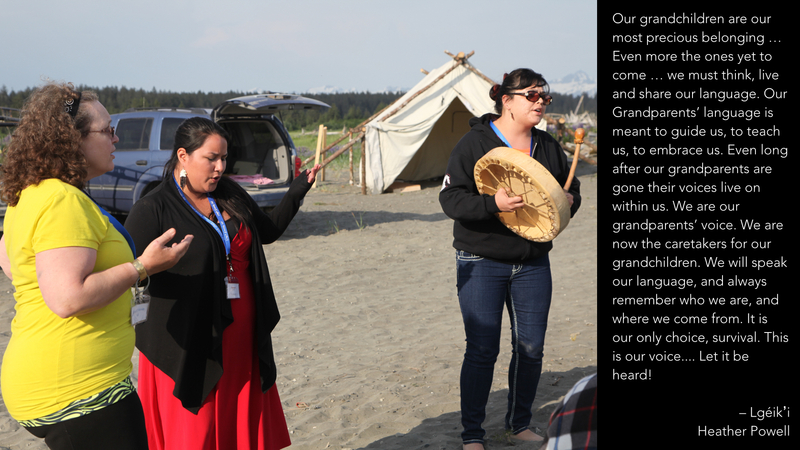 I want to tell about Tlingit oratory and the healing power that it has. We have medicine people, and we have a special relationship with kayaaní, the plants that are our foods and medicine. Our people learned by watching the natural world how to heal. 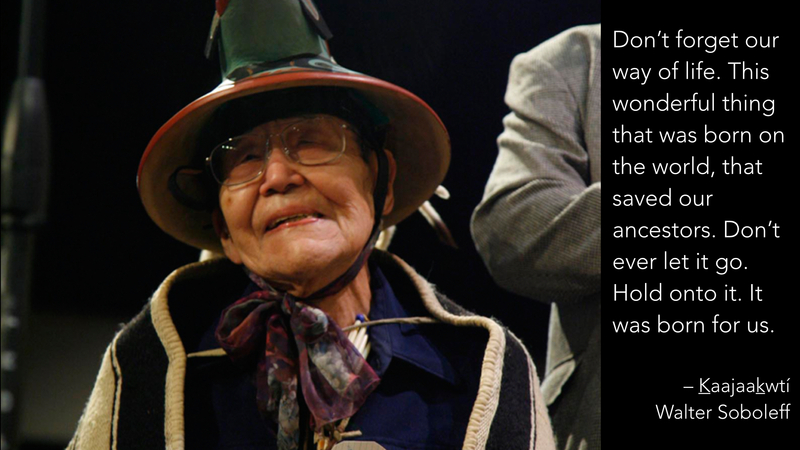 One of my grandparents Kéet Yanaayí Willie Marks told of an uncle who sent his nephews out to kill a brown bear. When they returned he asked them how it went and they said we were only able to wound it. The bear ran into the forest and we couldnʼt catch it. It ran through a marsh and tore up some x̱ʼáalʼ, what is called in English skunk cabbage—those Dleit Ḵáa, theyʼre not that good at naming things, but we all know they love naming things, right? X̱ʼáalʼ. This bear tore it up and put it on its wounds, and that is how we learned to use this powerful medicine. We can make medicines that cure the body. We bond with our foods and laughter and stories. But we are hurting in such a tremendous ways, we are often horribly wounded, and it feels like we are in dark corners where the world has left us to die. But that is not the truth. We have stories about when the Raven released daylight on the world and it changed forever. We have stories about people who have overcome everything and made it back home. Willie Marks and his brother Peter signed up for Chemawa Indian Home School when they were teenagers. After seeing the extreme punishment for speaking their languages, the horrible food, and the suffering of other children, they escaped and ran away. They made their way to the coast, and eventually all the way back home. Those are our narratives. This is not a story about language loss and death. This is a story about all these groups, all these beautiful brown people, who survived it all and are standing here speaking the same languages we were born into all those thousands of years ago. If you look at the screens here you see six bilingual children who are being raised with the Tlingit language. They live in two different communities and are from three different families. At home, we went five decades without a single child learning our language, and now we are seeing the tide come back in. The salmon are swimming back to the places where their parents bit the shores for them, marking the place that they belong. These children know how to laugh in our languages. They are making up names for things like x̱ʼéishxʼw sʼeenáa which translates to “blue lamp” and is the name one of these kids gave to the peacocks that live on a farm in Juneau. They are proof that intergenerational trauma has a dying point. Itʼs not that we avoid talking about all the nightmares we have lived through. Nope. We are aware and are documenting what our elders went through when they were babies. One elder recently told me, “it was torture. They tortured us.” We are using that as fuel today. We are thinking of the days when it was unheard of for someone to come and just wreck the world that we lived upon. We are fighting the system. However, that is not our primary focus. 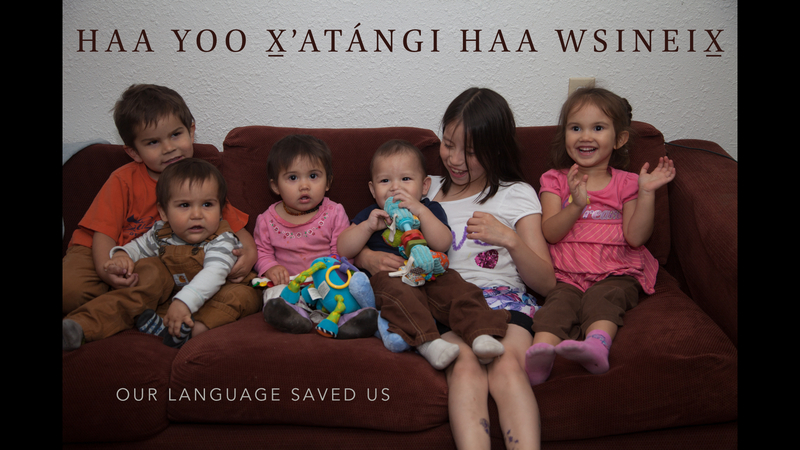 Our primary focus is raising our children with our language so it is a part of their lives just the same as Ax̱ Gawdáankʼi (My Little Pony), Dleit Dleit (Snow White), and Sʼigeiditaan Ḵáa (Batman). So let me now tell you a little bit about Alaska. 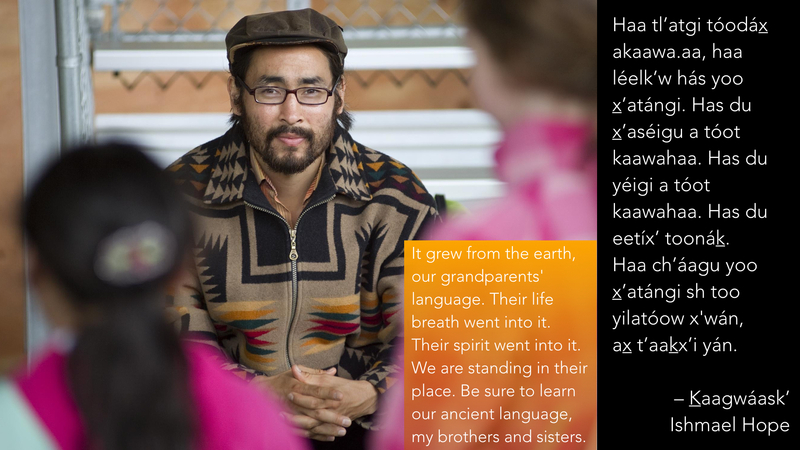 There are 20 Alaska Native languages that belong to four language families. 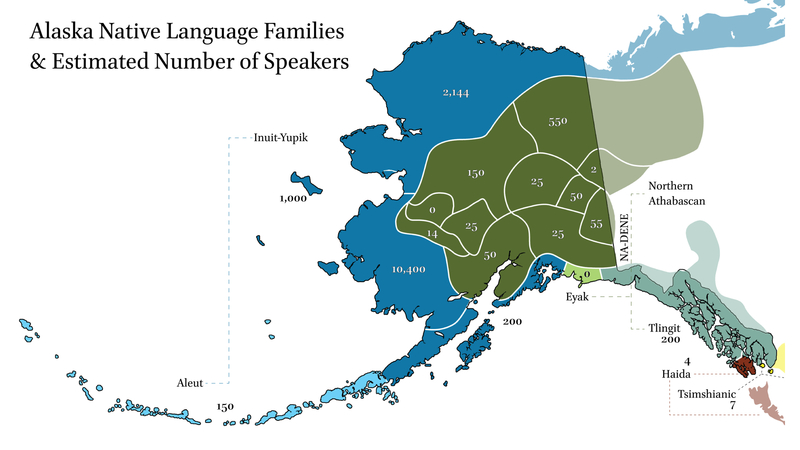 The largest and most healthy group is Yupik, but over half of Alaskaʼs languages have fewer than 100 speakers and two of them are rebuilding from losing their last fluent birth speaker. We have the highest rate of violent crimes in the nation, and Alaska Native people have the highest rate of suicide: it is the leading cause of death for Alaska Natives under 20 years of age. We have an education system that is abysmally and violently colonial, and it is killing us every single day. In western Alaska, half the men do not reach 30 years old. We have some of the highest population rates of indigenous people, but we have a state that is often ignorant, as American states tend to be, about its own origin story. I was recently on a panel judging literary awards and we had about 25 samples to read. When I got to the seventh one that was about the Gold Rush, which started with, “no one writes about the Gold Rush,” I kind of wished I had never learned to read. Several years ago my youngest brother and I were driving down to Haines from Fairbanks to put up fish, and we stopped at a rest stop between the U.S. and Canadian Border. They had an interpretive sign that talked about the history of the Yukon. It had a timeline that said 15–20,000 years ago the first people came to the Yukon, and in 1896 Gold was discovered and a whole bunch of stuff happened after that. The funniest thing about colonialism, which really isnʼt that funny, is this: no matter came before us, nothing really came before us. If ignorance is bliss, then this might be heaven. Okay. Back to the story. Lingít aaní káx̱ áwé uháan, ḵu.aa yá taakw.eetixʼ Táaxʼaa Aaní yáx̱ áwé haa aaní. 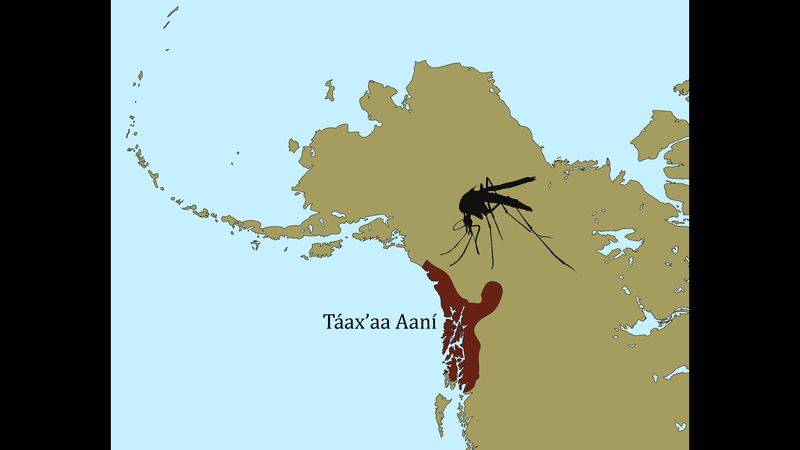 We live on what we call Lingít Aaní (Tlingit Country), although in the early summer, what we call “the remains of winter,” it is more like Mosquito Country. We have a story about where the mosquito comes from. Long time ago there was a great famine. People struggled. People starved. People began eating other people. Cannibals were born at that time. They were hideous. This young man, this boy, he found and killed that cannibal. Déix̱.aa du húnx̱u hás aawax̱áa wé ḵusax̱á ḵwáan. A yáanáx̱ áwé du tulixʼáani. Ḵúdáx̱ áwé. Du tóot awe yáaxʼ: wáa sá yéi x̱at gug̱anei? Yá ḵusax̱á ḵwáan ax̱ húnx̱u has aawajáḵ. Yéi awe yankát tuwdishát. Shoot awdi.ák. A kát aawax̱útʼ. X̱ʼaan kát aawax̱útʼ. Wáa nanee sáwé a kélʼtʼi awli.óox? Du tulixʼáani tóonáx̱ áwé áwé táaxʼáax̱ wusitee. Táaxʼaa ḵoowdzitee wé gaaw, aadáx̱ áwé haa gastáxʼch yeisú. Shaadaaxʼ Robert Zuboff would tell this story. Kaalḵáawu Cyril George would tell this story. It had killed his two older brothers, this cannibal did it. This young manʼs anger was too strong. It was too much. The thought was inside him: what will happen to me? This cannibal killed my older brothers. And then he made his mind up. He build a fire. He dragged it on top. He dragged it onto the fire. At what point was it he blew on its ashes. Through his anger the ashes became mosquitos. Mosquitos were born at that time, and from that moment they are always biting us. On the screen is an image of my youngest daughter dancing for her elders at a ḵu.éexʼ in Sitka for my dear friend Dan Moreno. In the background is her older sister Ḵaalḵéisʼ Kiana Twitchell, their mother and my loving wife Ḵáalaa Miriah Twitchell. Next to them are their cousins and auntie Lgéikʼi Heather Powell. Her grandmother Shgaté Jessie Johnnie names my two daughters. One of the things that happened in Alaska is the governance of Alaska shifted several times. When the Russians were paid for “selling” Alaska to the United States, even though neither of them owned it, the first Americans to govern Alaska were the U.S. Military. As was common in that era with other Native people, the governmentʼs military tried to destroy us. After they bombed three of our communities: Kake, Angoon, and Wrangell, the governance of Alaska was given to the churches of America. At a small meeting in Washington DC, Sheldon Jackson and a few others took a map of Alaska and divided it between the major Christian religions. These groups were in charge of governing Alaska and its people. This was don by sending a religious leader to Alaska villages. This was usually a middle-aged white man, who was in charge of everything. The people had to ask what they could do when it came to their own culture and beliefs, especially our ceremonies. This man could thumbs-up or thumbs-down anything, and the first things they banned across most of Alaska were our languages and mask dancing. Over time, they told many of our people that we had too many ceremonies, and we needed to consolidate, often to one ceremony. We had ceremony for everything. Marriage, young women coming out of seclusion, and young manʼs first hunt, names, buildings, totem poles, and death. For our people, if we had to pick only one, it would be to take care of our deceased. But these churches did away with our other ceremonies, and the world is out of balance is the only thing your culture can deal with in a ceremonial way is death. People stopped getting new names. Houses were no longer dedicated like they were. More dangerously though, is our cultural ceremonies were tied only to the death of people, and children would come to see our ceremonies, language, and culture as things that are reserved for death, and are therefore likely to die. We are trying to change all of this. We are trying to teach our children that we have ceremony for all things, that we respect and talk to all things, and language and cultural ceremonies are as much for joy and rebirth as they are for caring for those who have walked on. 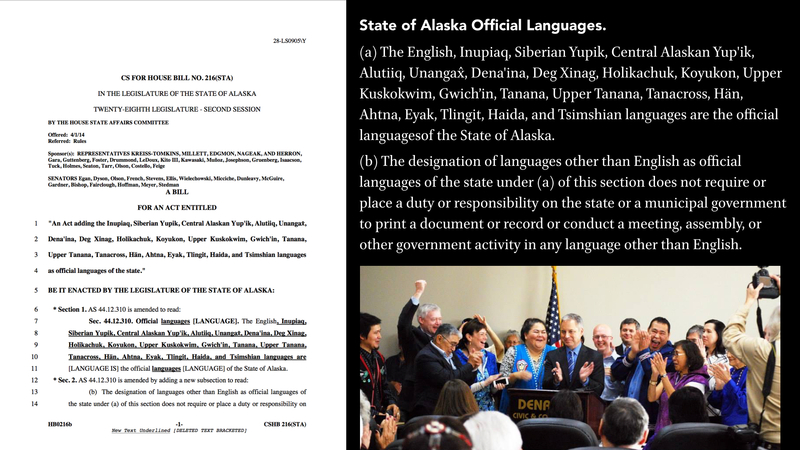 The best news about Alaska, though, is that as of last year, all 20 Alaska Native languages are the co-official languages of the state. The words on the screen there are what made that change. What started as an idea in a speech to my Tribe, the Central Council of Tlingit & Haida Indian Tribes of Alaska, turned into a focused idea, then into draft legislation, then a series of debates with people who apparently felt like looking like silly racists while losing debates (my Norwegian ancestors came here and stopped speaking Norwegian), and then a 17 hour sit-in protest at the capital by over a hundred people throughout the day on Easter Sunday. 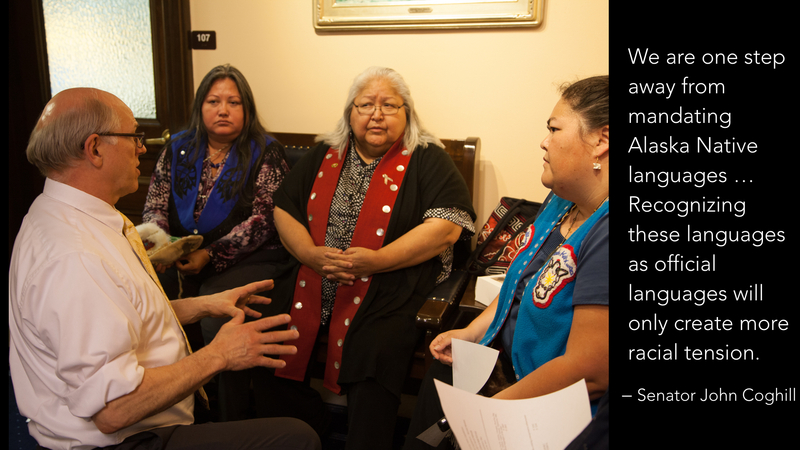 After a concession speech by one of the most powerful white men in Alaska, the bill passed with only two people voting against it. While watching the concession speech, I realized that the time is arriving when people will be powerless when it comes to stopping the flood that is indigenous language revitalization. We are winning, and we are not going to stop winning anytime soon. Not Charlie Sheen crazy winning, but our languages are coming back into full use winning. Our children are raised within our language winning. We also have great memories. We donʼt forget. You know that whole oral tradition thing? I know elders who have stories that take four days to tell. And not like, let me tell you after work and then weʼll have dinner, and then maybe Iʼll start again in the morning, but more like I will start talking now and be done four full days from now. And it must be told right. This is the power of our minds, brother and sisters. We are the descendants of the most intelligent, loving, strong, and understanding people. We are the ones who are going to carry this thing forward without fear, and most of all without killing one another or ourselves. The days of losing are over. The days of wondering when it will finally end and start coming back are history. This is our release of the daylight, here to change the world for our children, for the better. This guy kneeling here was the one who opposed language equality in Alaska. I am not much for politics, but let this be my smear campaign. Let me show you what racism looks like today. It is someone trying to logically explain how you donʼt understand what Iʼm trying to do, that the long term implications of equality are not for the greater good of everyone. That treating each other as equals will only create more racial tension. This is what someone looks like who has convinced himself that he is only the Devilʼs advocate and not the Devil himself. But enough about that guy. I went for a full year without saying his name or where heʼs from, but if you have friends in North Pole, Alaska, then tell them who they should vote against. Okay. One of the things that bothers me is this: correcting a learnerʼs pronunciation when they are trying to communicate in the language, and then not bothering to communicate with them in the language. I see speakers who do this at times, and while I love and cherish all our speakers, I think we need to just be in the language more than being in correction mode all the time. Donʼt get me wrong here: there is a time and place for correction. Pronunciation is important. But make sure you communicate! Language is about expressing wants, needs, thoughts, feelings, laughter, sorrow, and more. Donʼt stop it. Even the best speakers make pronunciation mistakes. If you want to play along, please repeat after me: x̱ʼwáalʼ x̱ʼwáalʼ x̱ʼwáalʼ x̱ʼwáalʼ. Now, repeat after me again, and this is a different word: g̱wáalʼ g̱wáalʼ g̱wáalʼ g̱wáalʼ. The first time we said: eagle down, eagle down, eagle down, eagle down. Spiritual right? Beautiful, yeah? Down feathers. The second time we said, “fart, fart, fart, fart.” But it wasnʼt a command form! Donʼt let it go yet! This one time a speaker wanted to use a metaphor in ceremony to another speaker: x̱ʼwáalʼ yax̱ yatee i yóo x̱ʼatángi, your words are like eagle down. We see where this is going right? Itʼs a true story! He stood up and said, very loudly because that is how we do, g̱waálʼ yáx̱ yatee i yoo x̱ʼatángi. Your words are like a art. 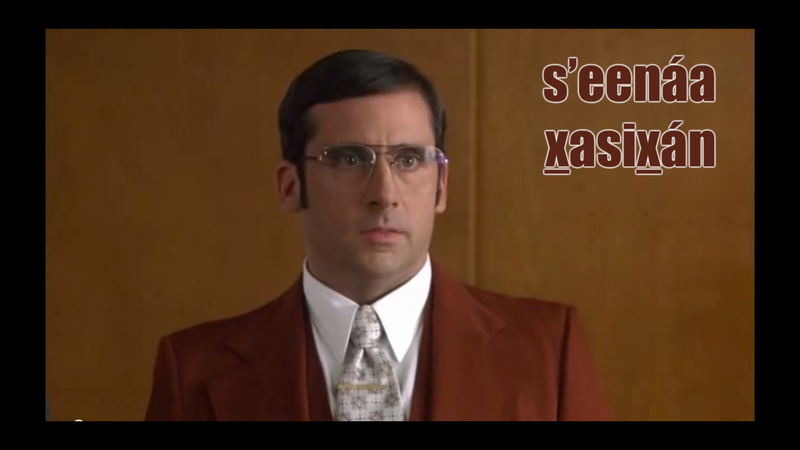 Now the person he spoke to, who is also a speaker, stood up and exclaimed: gunalchéesh, thank you! Everyone makes mistakes. How I got here: I flew. Just kidding. I come from a land of steep mountains and bountiful oceans. Our lives are based upon the cycles of the salmon, and upon the lives of things that walk on the land, which we call at gutu.ádi, the things that swim in the water, which we call hintak.ádi, and the things that fly in the sky, which we call át kawdliyéeji.át. We are the fourth walking thing in that equation, and we walk upon a world that is populated by aas ḵwáani, the tree people and kayaaní, the plants. We talk to all of them, thanking the tree people for providing our homes, canoes, tools, weapons. We talk to the plants and thank them for making strong medicine for our people. We talk to the fish and thank them for being plentiful in their return. Yéi áwé haa ee wududlitóow, ldakát át tóo yéi yatee, a yakg̱wahéiyag̱u. Ách áwé woosh yáa awudanéi nooch. Haa aaní káx̱ chʼa ldakát át ax̱ʼaya.áxch Lingít yoo x̱ʼatángi. Haa een has akananíkch «kʼidéin yoo x̱ʼatán ldakát át daat». Áwé. Has du sáaxʼu wutusikóo, ách áwé Lingítx̱ haa sitee. Chʼáakw áwé haa Tlaguḵwáanxʼi Yán, ldakát át haa aaní káx̱ has awsikóo, ách áwé ldakát átx̱ has woox̱oox̱: haa éet idashí xʼwán! This is how we are taught: everything as a spirit in it. Because of this we always respect each other. On our land, every single thing can understand Tlingit. They always tell us, “speak carefully around everything.” Yeah. 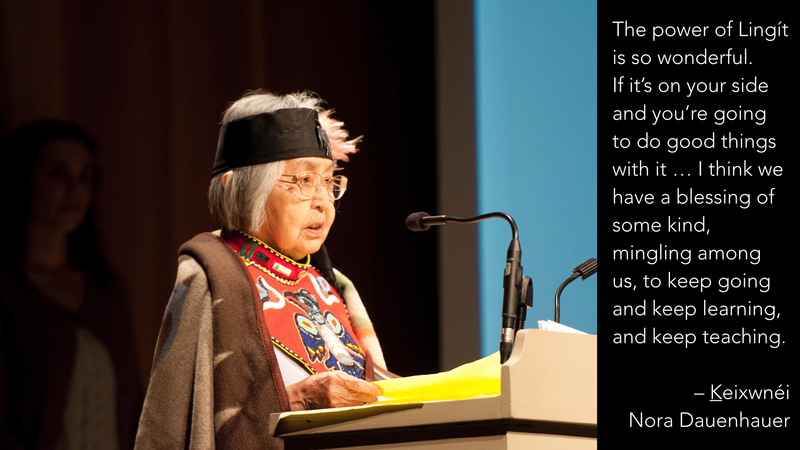 We know their names, and because of that we are Tlingit. Long time ago, our Ancient Ones knew everything on our land, because they asked of everything: come help us please! 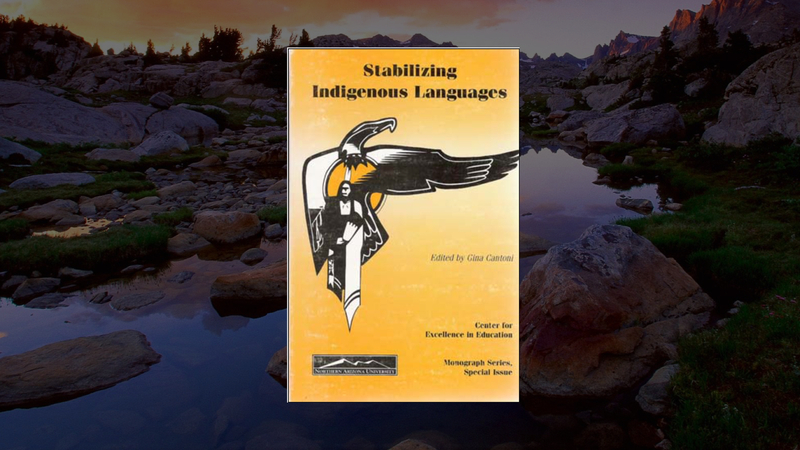 I was at the University of Minnesota Twin Cities in 1996 when I found the book Stabilizing Indigenous Languages. I read it cover to cover, running my highlighter dry. At this time I was 21 years old and had been studying Tlingit with my grandfather Gooshdehéen Si Dennis and on my own for about a year. It lit a little fire and I wrote a paper for an upper level English composition class. The TA returned it at the next class with a C– and the words “why donʼt we all speak English?” on the cover. There were no notes in the paper about what might be wrong with it. I was pissed. As my grandmother would say, “I was madder than a wet hornet.” I took it to the Professor and the English Department, and they changed the grade but never resolved the situation as far as I could tell. That lit a big fire, and I decided then and there that fighting for languages was the thing for me. Last year was the first time I attended SILS, and it is one of my lifeʼs great honors to be asked to present here. I thought about it an awful lot, 19 years after that paper I am here talking to you, who are what we call sh yaa awudanéixʼi, self-respecting and honorable people. Gunalchéesh. My family, my Tribe, my community of speakers and warriors, we all thank you for sharing your time and land and food today. The Wind River Indian Reservation and the University of Wyoming have been wonderful hosts, and Caskey Russell is a great friend and colleague to help me get down here and live a dream that I have had for years now. We are going to take a little break from what we have been doing and have some fun. 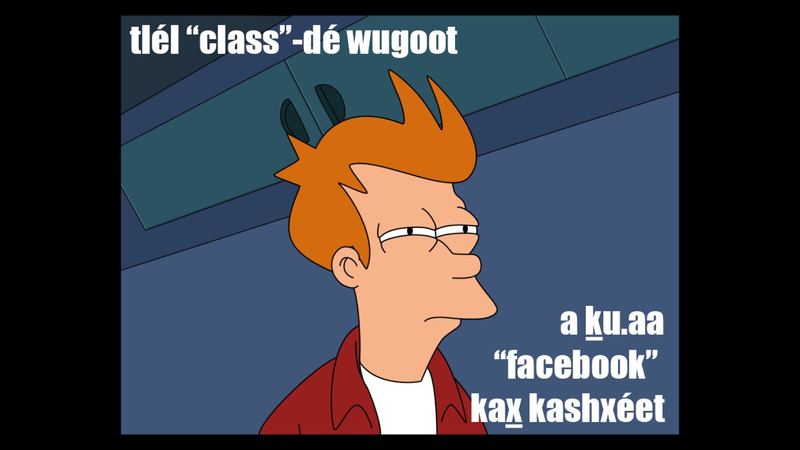 Several of my students began making memes in our language. When I was teaching composition years ago, students were talking about memes. I asked them, “whatʼs a meme?” and they replied, “thatʼs a meme!” They never told me what it means, but it is basically an image with text formatted in a similar way that does something cheeky and silly. We started making these because we want the students to own the language, we want them to understand its sacredness but to have fun and to use humor to help combat the harsher things in the world. This slide is not a meme but is artwork from my friend Larry McNeil. I think that here in the plains it is appropriate to see Edward Curtis taking a shot from Tonto in an act of deconstructing western paradigms. I think we must remember to laugh. We know enough about the sorrows of the world, and we have always enjoyed the healing power of laughter. One of my favorite elders in the Yukon, Ḵaaklig̱ei Norman James tells me, “when I was young we used to watch all the old people and say, ‘all they seem to do is go around to find someone to laugh with,’ and pretty soon we realized we were doing the same thing.” I think that is something we are supposed to do. Táach uwajáḵ. At home we want to put things like this up without translating them, but I will explain them to you since I am a guest here in your country. This means “sleep killed him.” Whenever we translate we have to pick a gender for our pronouns, which is always frustrating because we have ungendered pronouns. But this is a fun phrase that would be used if, say I were giving a talk and someone just went head down falling asleep, or a baby is sleeping and you can just carry it around. These last two are not language related, but will help us get to the next topic. We talk to students, colleagues, and the public in a very straightforward way when it comes to the genocide of Native American people. Shgúndi William Paul was a civil rights leader in Alaska. He was the first Alaska Native attorney and first Alaska Native Territorial Legislator. He helped desegregate Alaska schools, got Alaska Natives the right to vote, and initiated land claims settlements. He was bold, at times argumentative, and downright terrifying to white men in power at the time. 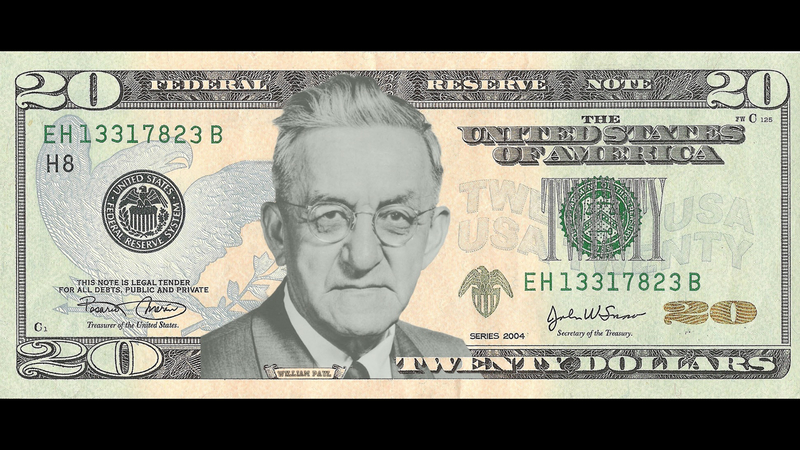 Last year the Central Council of Tlingit & Haida passed a resolution supporting putting William Paulʼs image on a $20 bill instead of the Indian killer that is on there now, and that we have to see whenever we get or spend our hard-earned money. It is interesting to think about how we look at people and their actions. We do not take the word genocide lightly, and I believe firmly that William Paul is not talked about often in Alaska because if brown people are going to have heroes, then those heroes had better be perfect, flawless, made plastic by the romanticism of American consciousness. Before I talk about this photo I want to share a fun phrase with you: ax̱ tuwáa sigóo i lú x̱wasaneexʼí I want to sniff your nose. We call this snix. It is a traditional form of greeting, especially between parents and children, and grandparents and grandchildren. There is something special about breathing the same air in the same place at the same moment. We need that love today. It is who we are. On the coast the Tlingit people sometimes have a reputation of being warriors. I make fun of this concept all the time, like in the last meme Iʼll show you today. In all those old pictures, we never smile, and I think thatʼs silly. They must have been asking people to frown all the time because we love life and love to laugh. This next one continues to make fun of the stoic Indian concept. 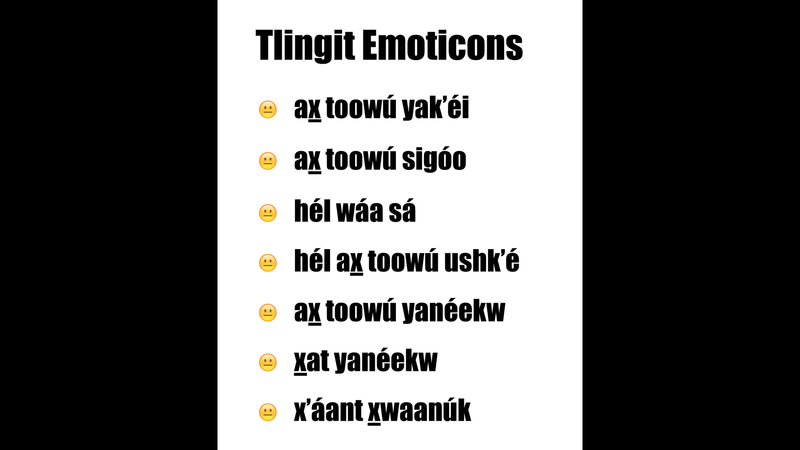 It is titled Tlingit Emoticons and the text is ax̱ toowú yakʼéi, ax̱ toowú sigóo, hél wáa sá, hél ax̱ toowú ushkʼé, ax̱ toowú yanéekw, x̱at yanéekw, and xʼáant x̱waanúk, which translates to I feel good, I feel happy, itʼs okay, I feel bad, I am feel sad, I am sick, and I am angry. 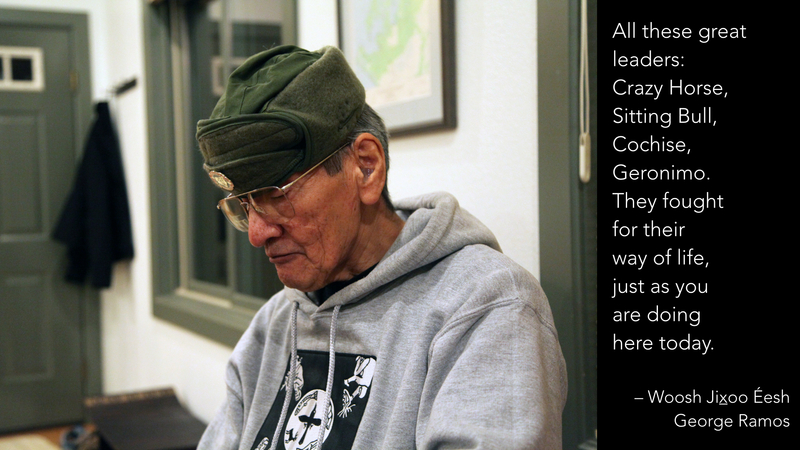 One of my very favorite elders, Ḵaalḵáawu Cyril George, would tell us this story all the time. There was a time one of our villages was raided. People were coming to capture the village members and take them as slaves. This is something that happened on the Northwest Coast. The people ran up into the hills and hid. There was a man who got away, and while he was hiding he heard the voice of his son who was being taken slave. When he heard that voice, he didnʼt even think about it, he ran down to be taken slave to be with his son. That is how strong our love is for one another. 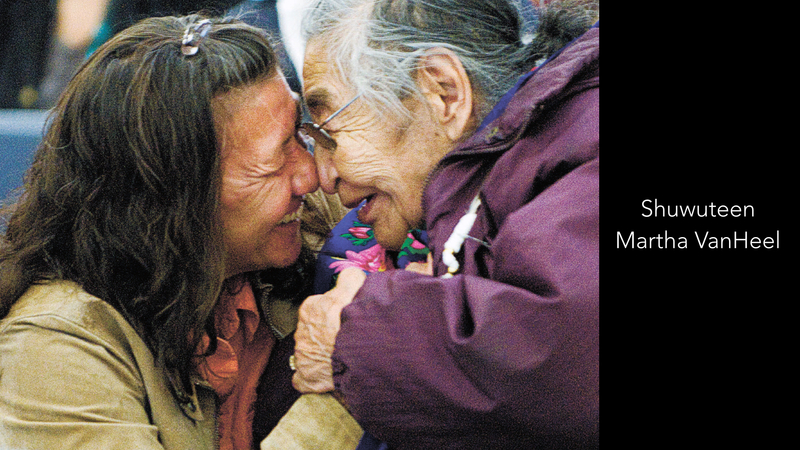 The elder pictured here is loving an indigenous woman who testified at a Truth & Reconciliation hearing in Canada, where the government is being held accountable for what they have done to indigenous people. We are ready to be done with all of this grief and trauma. It isnʼt ours. We no longer claim it. It is almost a year to the day when my father died, and I want to share with you the last words he ever said to me: I love you. Iʼm proud of you. Iʼm sorry I never told you that, but I didnʼt know I was supposed to. No one told me when I was young. My parents had a hard time. I was put into a boarding school in Palmer. Me and my younger siblings went there. It was a Catholic School. My sister was raped. I couldnʼt stop them. I tried, and tried, and tried, but they beat me in the face, over and over again. I was never the same after that and Iʼm sorry. I want to tell you about our homeland, Lḵóot. Take a deep breath. Itʼs going to get difficult. It is going to wash over us for a moment. It will get better, but this is the process of letting go. This is the release of the greatest trauma of America, caused by America, ignored by America. Steel yourself. We say Lḵóot, and this is the place where a piece of the mountain broke off and flooded the valley, washing out our clan houses. This is the place we call home. They call it Chilkoot. One time we were invaded here by a warring tribe. Our íx̱tʼ, what we might call a medicine person, a visionary, saw it coming and told the people before it happened to run up onto G̱eisán, Mount Ripinski, and the people did. This healer stayed behind with his assistant and then they ran up after the people left. As the village was being raided, the íx̱tʼ said to his assistant, “I forgot my drum. Run down there and get it.” His assistant did not want to, he said that he would be seen and killed if he did. The íx̱tʼ said, “I will sit under this blanket and sing, and so long as I do no one will see you. When you get my drum, start hitting it as loud as you can.” The assistant didnʼt want to do this, either, because he would be heard and killed. The íx̱tʼ assured him he would be fine. So he ran down the mountain. Just as he had been told, no one saw him. He found the drum. Even though he was nervous about it, he began to hit the drum hard. As he did, the drum flew towards the mountain and carried him there. This mountain is also the place where our men went when they got sick. Influenza. Small pox. Tuberculosis. They hid in the caves to protect their families. They knew they were going up to die. This is the place our clan calls home. We had our clan houses there. There were many of us there. The saak (eulachon) and g̱aat (sockeye) run strong up the river. This is home. In the early part of the 20th century the U.S. Navy showed up and built a fort. They brought their boats with them. This was when things really began to change for us. This is what I am going to talk to you about now. Them and their boats. That is when our women began washing up on the beaches, killed and covered in seaweed. Killed and covered in seaweed, our men would find them washed up on the beaches. This is how we know you. And this is the end of your great denial. And this is the beginning of reconciliation. Did you know that our identity is born through our mothers? and they were washing up on the beaches. a woman cried on the beach. Láx̱ʼ. Láx̱ʼ áwé yoo tuwasáagu át. Du x̱ánt uwagút. Herron. It is this thing we call Blue Herron. It came beside her. He instructed her to swallow a round black stone heated in a fire, found on the beach. we have the stories and the truth. We have the beauty and the light. We are everything we need: we will be as strong as we ever were. ix̱wsiteen. I see you. 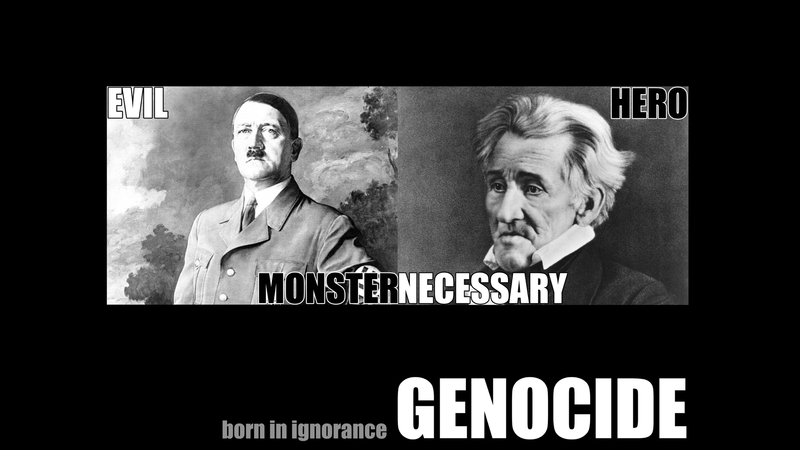 We were taught to say this to our monsters, to take their power away. In closing, I want to share some thoughts of my elders and colleagues with you. They are coming with me, because they are always with me. I hear them when I lay down to sleep. I feel them when I wake up in the morning. I often tell my students: you are going to connect with our elders and you need to know what that means. They are going to tell you things, in the later stages of their lives, that no one else in the world can understand except you who are fighting for and carrying our language. You are going to share a bond with them that is so unique and special. And then they are going to travel along to the next world. But they do not leave us. Tlél haa náḵ woo.aat. Chʼas has du at wuskóowunáḵ has woo.aat. Haa jeet has aawatee. Haa jeet has aawatee ách áwé has asix̱án has du dachx̱ánxʼi sáani. Yee jiyís áwé wududliyéx̱ haa yoo x̱ʼatángi. Aax̱ gatí! They did not walk away from us. It was their knowledge that they left behind. They gave it to us. They gave it to us because they love their little grandchildren. It was made for you all, our language. Pick it up! I want to thank you and the people of the Wind River Indian Reservation for this invitation. Yesterday they keynote speaker talked about finding reasons to speak the language for your people. At home we are trying to come up with ways to do this, like separate pay scales in our Tribe for people who can speak their language, better pay for our elders who work with us, and immersion school for our children. Also, we are aiming high and hope to make speaking our language a qualification for Tribal leadership as Council Members and Supervisors. 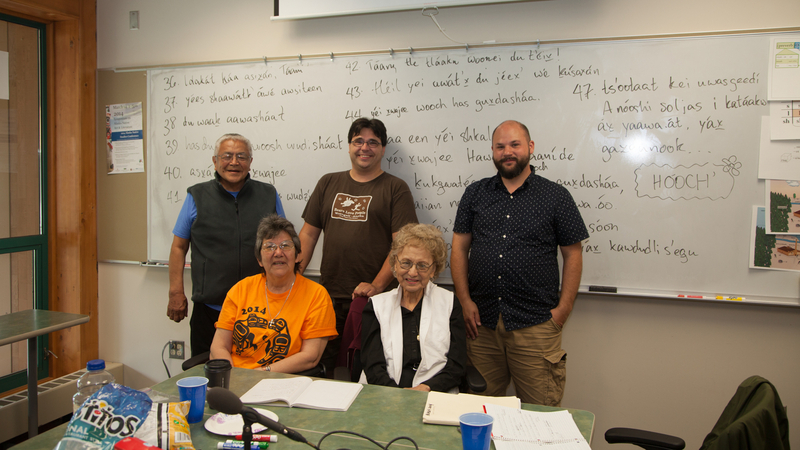 That might be difficult to convince our people of, and perhaps even more difficult would be making one semester of Alaska Native language study a requirement for high school graduation. But we need to value our languages. We cannot succeed within the value system of Euroamerican Society. It does not value us, so we must create our own value systems and stick to them no matter what. This next piece will be my final thing for you this evening. Maybe itʼs more than four. Iʼm really not that good at counting, but we love that number back home. It is sacred. You are sacred. Thank you for your time and energy. Thank you for fighting. Gunalchéesh. Yee gu.aa yáx̱ xʼwán! Have strength and courage. Donʼt quit! You are the beauty and the light. We are in a canoe built of intention and fortitude. who show us the love that the old photos never captured. Donʼt fight with each other! getting stronger with each generation. and our bellies will hurt and our feet with feel like the sun on the earth. Make your children into seeds. where we know they used to be and should be again. where we reclaim a world that embraces us and who we were meant to be. Alaska Legislature. “CS for House Bill 216(STA)” The Alaska State Legislature. nd. Web. 1 May 2014. 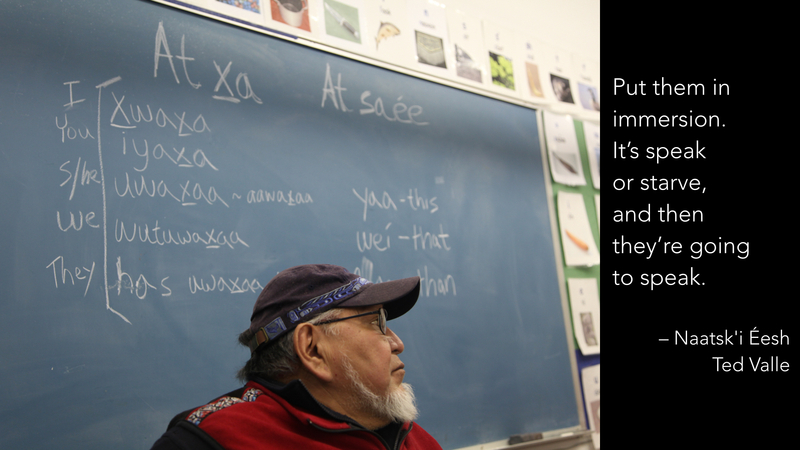 Alaska Native Language Center. “Population and Speaker Statistics.” University of Alaska Fairbanks. nd. Web. 2014 May 5. Alaska State Library and Archives. 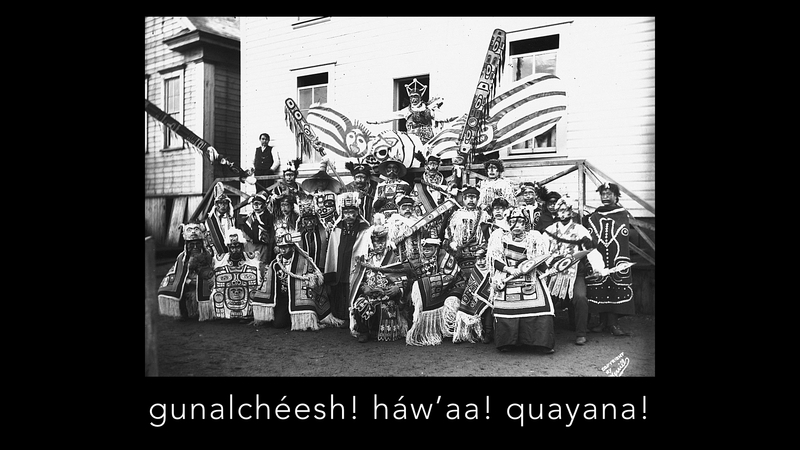 “Photo of Tlingit clan members from Angoon, Aalaska at a potlatch in Sitka in 1904; Elbridge W. Merrill Collection/ Alaska State Library and Archives, # PCA57-028.” McGraw-Hill Education. nd. 26 Oct 2013. Dory, Nicholas. 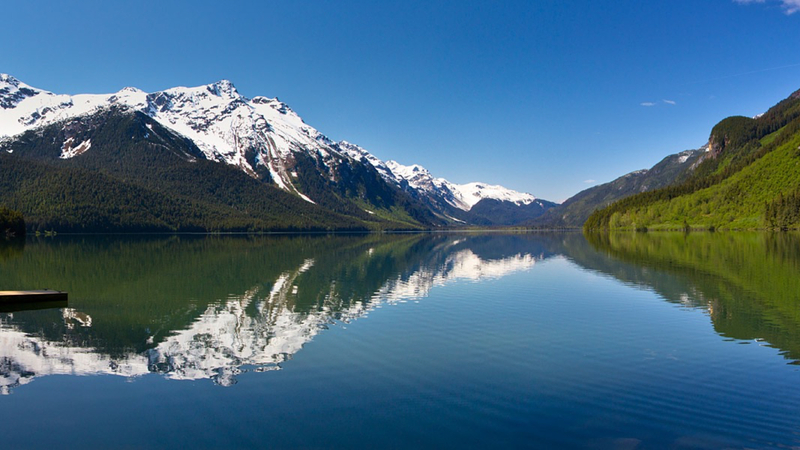 “Chilkoot Lake.” Nicolas Dory Photography. 25 July 2011. Web. 4 Jun 2015. Ecotrust. “2011 ILA Honoree – Nora Dauenhauer.” flickr. 2 Nov 2011. Web. 4 Jun 2015. Hope, Ishmael. Personal Communication. 4 Jun 2015. McNeil, Larry. Tonto Gives Edward Curtis a Lesson in Native Values. Larry McNeil Photography. 2105. Web. 4 Jun 2015. Penn, Michael. “Ishmael Hope listens to performers in Perseverance Theatre’s Summer Theatre Arts Rendezvous (STAR) rehearsal of his new play, The Bailer at the Back of the Boat, at the Noyes Pavillion at University of Alaska Southeast in Juneau, Alaska.” Washington Post. 14 Dec 2014. Powell, Heather. Personal Communication. 4 Jun 2015. 4 Jun 2015. Wallace, Brian. “The Rev. Walter Soboleff at Sealaska Heritage Institute’s Celebration 2008.” KTOO Public Media. 27 March 2014. 4 Jun 2015.